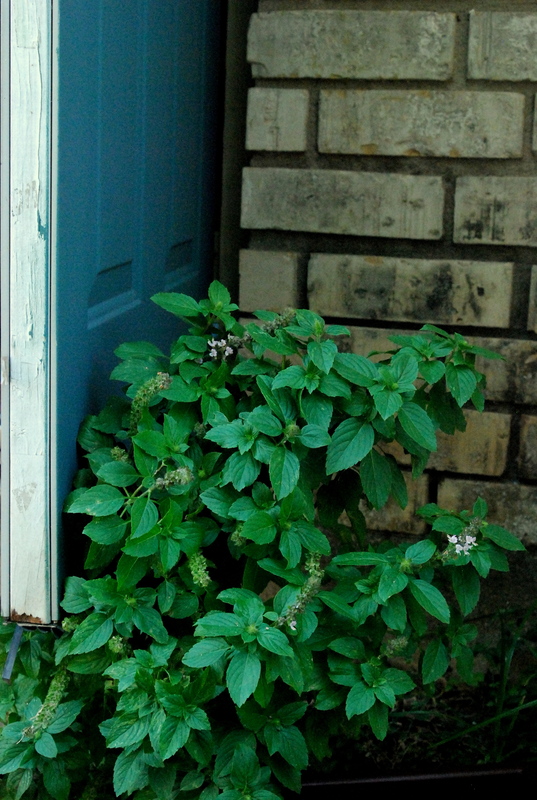 The Thai basil from the front bed that froze to the ground last December and showed no signs of returning? It has finally had some self-seeded sprouts reach maturity though! The bees around here must love licorice, because they cannot get enough of the blossoms on these ones. Speaking of self-seeding herbs, it took me two years of trying to get my Texas Hummingbird Sage seeds to sow, another year after that to get them to put on their first real leaves before kicking the pot, and finally last year, in my fourth year, with the last of the seeds in the packet, four seedlings reached transplant strength…only to lose three their first night out in the world. You had better believe that that fourth transplant last year received some serious babysitting and careful attention! Don’t try and start herb seeds indoors like veggie seeds. If you do, double your efforts. They are much less forgiving. Don’t over nourish the soil with compost or seaweed. Put them outside in their pots. I think they hate AC. All of that effort finally paid off when it survived the summer, flowered, and went to seed. Then came the next test – would I have to order another seed packet? Or would it really prove it was “Texas” Hummingbird Sage and successfully self-sow? We don’t eat this herb (yet.) It has a curious flavor profile to DH, and I downright don’t like it. What I do like? Those beautiful scarlet blossoms that emerge from the Japanese-Temple-style buds. July around here was lovely. We stopped with the triple digits for a few weeks. It rained (yay!) multiple times. It was actually a summer I could call “lovely” by Texas standards and was such a mental relief to so many local residents after the built up anxiety of having another year like last year. That loveliness translated into a resurgence of growth in my Heat Bed! Totally unexpected, and such a pleasant surprise. This little gentleman tried to die in his pot on the porch. Then he nearly died his first week in the ground. Again he looked like a thicket of dead twigs nearing the end of June. He’s even happier now than he looks here.